Polka dots, belted waist and a fit n'flare shape? This dress hits all the check boxes on my list. And at 50% off today - how could anyone say not to a frock this cute? I'm loving with light trenches now or the thought of a light cardigan for the warmer weather (if it ever shows!). Hope you're having an awesome week! Gorgeous!!! I am loving that jacket with it. It completely makes the look! Retro chic, classy and ladylike outfit! You're looking gorgeous top to bottom! Love the dress and trench. Perfect combo! Darling look! So feminine and beautiful! Such a darling look! I love the pop of blush in that jacket. SO pretty for spring! Are those shoes comfortable? They're so cute but they seem like such a pain! Everything about this look is amazing!! I love it!! What a beautiful romantic look! This might be my favorite post of yours ever! 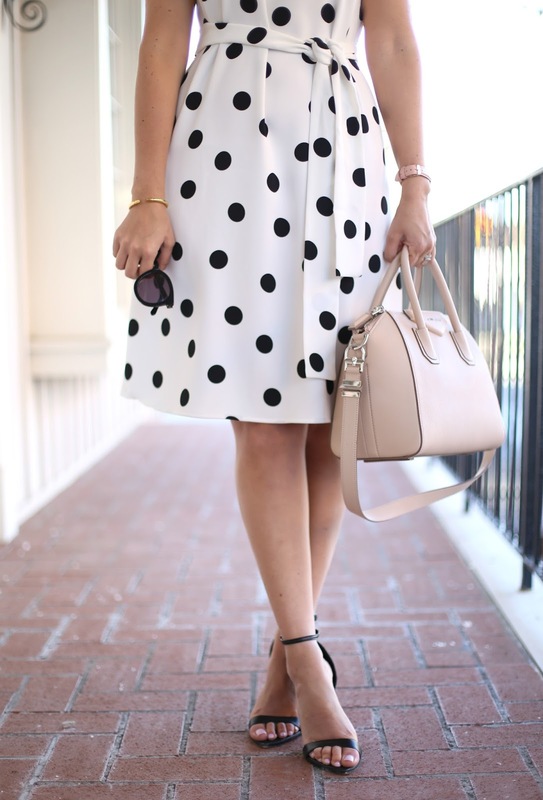 I absolutely love the polkadots paired with the blush tones! Absolutely stunning. Your polka dot dress is so cute!